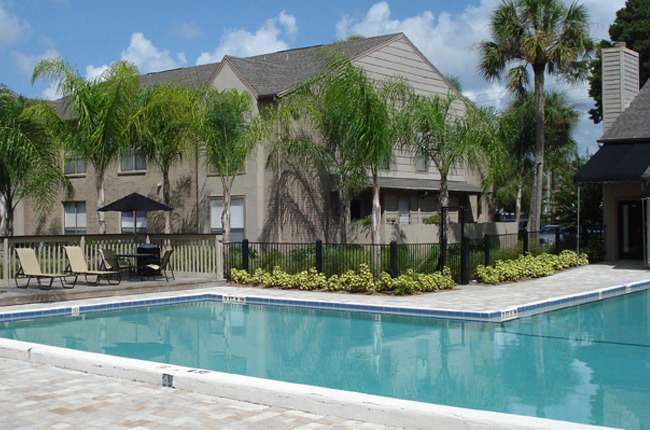 Baywater Apartments is an apartment community located in Tampa, Florida that offers a lakeside oasis with waterfalls, fountains, and a resort-style pool. Come relax with a good book at the gazebo and enjoy the scenery! We feature one and two bedroom apartments in an array of five unique floor plans. Our quality-crafted apartment homes reflect our masterful attention to detail: cook a delicious meal on our new electric appliances, unwind on a private screened in patio, or enjoy ample storage space with our walk-in closets. For the fitness conscious, we have a jogging path and a fully equipped fitness center available 24 hours a day. Most importantly, Baywater puts you within minutes to downtown Tampa, the Westshore business district, major shopping malls, the airport, and more. Don't pass up the opportunity to live in total convenience! Come home to Baywater Apartments today! Conveniently located on W. Waters Avenue, Baywater Apartments boasts a central location in the heart of Tampa. We are surrounded by ample shopping. Across the street from our community, you will find Walmart, El Grande Supermarket, Save-A-Lot, and BJ’s Wholesale Club. A number of restaurants also sit along W. Waters Avenue such as Origami Sushi, Pollo Tropical,and Jazzy’s BBQ. If you feel like escaping the community to explore the Old Tampa Bay and all the great water adventures it has to offer, simply hop on the Veterans Expressway, which will take you anywhere you need to go! Speaking of places you need to visit, Downtown Tampa is located a mere 25 minutes away from our community so you can enjoy all the nightlife and entertainment this vibrant district has to offer. Awesome shopping opportunities, great eats, and a central location are all available to you once you become a resident of Baywater Apartments!